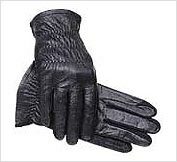 Economical show glove made with drum dyed, colorfast kid leather for long wear. Spandex™ gussets between fingers for flexible fit. Guaranteed not to stain your hands. Thin and soft.Gathered stitched wrist and back for comfort and neat appearance.Key area reinforcements.